"Ten thousand steps a day" has become a heavily promoted fitness mantra -- with good reason. The American Council on Exercise estimates that the average person can burn up to 3,500 calories per week by walking 10,000 steps every day. When you burn 3,500 more calories than you consume, you lose a pound of body fat. But eating calorie-rich, low-nutrient foods can pack the calories right back on, undoing all your hard work. Focus on eating a reduced-calorie, nutrient-rich diet to keep your body fueled for more walking and weight loss without replacing all the calories you just burned off. The 10,000 steps program is tailored for exercisers using a pedometer. You clip the pedometer to your belt and it counts every step you take. If you don't have a pedometer, counting steps taken during everyday activities isn't practical. But you can estimate how many steps you take on fitness outings, according to distance. 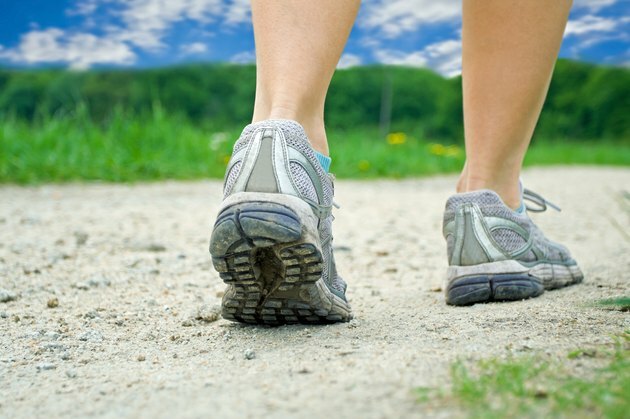 If you have an average stride, every mile you walk equals about 2,000 steps. The numbers listed here are estimates. The exact number of calories you burn depends on a variety of factors, including how much you weigh, how much of that weight is muscle and how fast you walk.